Chips and dip are a staple at any backyard, campground or beach summer event. FitNicePT pal Farrah at Fairy Burger loves this Dressed Up Salsa for several reasons. With lots of studying to do and a busy schedule on top of it, this quick, healthy and cost effective recipe is one of her favorite go to dishes. Farrah also loves that it’s simple, with only four ingredients, incredibly versatile and packs a good post-workout protein punch. Give this tasty Dressed Up Salsa a try today. It’s perfect for snack time or to accompany a larger meal and be sure to check out Farrah’s blog for more delicious recipes at Fairy Burger. Have questions? Want more good for you recipes or help with your meal plan? Send us an email at Info@FitNicePT.com or fill out the form below. 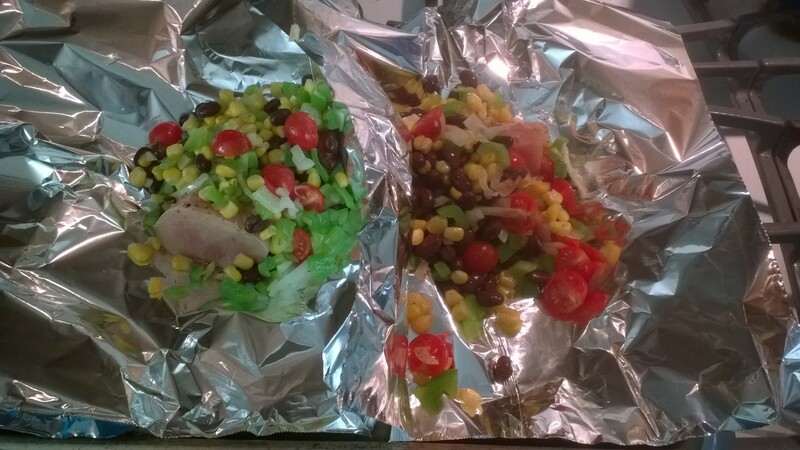 This entry was posted in Recipes and tagged recipes, salsa on July 14, 2014 by meredith@fitnicept.com. PB and J is a classic lunch dish that’s found at least once in a while inside every child’s lunch box. Whether it’s grape jelly, apple butter or strawberry jam the easy to prepare and pack sandwich is a school time staple. It doesn’t have to stay that way! With this recipe inspired by Team FitNice friend Alicia of Fitness by Alicia your entire family can have PB and J for breakfast, lunch and dinner without feeling guilty. 1. Spread peanut butter evenly over the four flatbreads. 2. Spread jelly or jam on one half of flatbread. 3. Layer granola, sliced banana and strawberries on top of jam or jelly. 4. Roll flatbread up beginning with side holding fruit and granola. Give this recipe a try today for a twist on the classic noontime meal. The whole family will enjoy the healthy dish and clean up is a breeze. Thanks to Alicia for sharing this recipe with us, be sure to check her out at FitnessByAlicia.blogspot.com! The blog is home to tons of great recipes, her real story of weight loss and lots of fitness fun. Want help with your meal plan? Send us an email at Info@FitNicePT.com or fill out the form below, we love hearing from you! This entry was posted in Nutrition, Recipes and tagged breakfast recipe, lunch recipe, recipe on June 30, 2014 by meredith@fitnicept.com. Eating healthy can be hard. Cooking can take a while and after a hard day at work, making dinner every night can be a drag. These are five of Team FitNice‘s favorite kitchen shortcuts designed to help you spend less time in the kitchen while making healthy meals that keep your lifestyle on track. Kitchen Shortcuts #1: Use simple cooking methods. Steaming, broiling and roasting are easy ways to prepare vegetables. Healthier than frying and faster than baking, these methods make flavor filled food fast and are sure to satisfy every palate that takes a seat at your dinner table. Kitchen Shortcuts #2: Stock up. Be sure to always have plenty of brown rice, quinoa, whole-grain pasta, frozen veggies, low fat nuts, low-sodium canned beans, diced tomatoes and chicken and vegetable stocks on hand. With so many ingredients close at hand, it’s easy to grab a few things out of the pantry and put together a quick, good-for-you dinner. Kitchen Shortcuts #3: Cookbooks. Save the stress of figuring out what you need at the supermarket. Have a stack of cookbooks that feature simple recipes without lots of fancy ingredients in the kitchen. Pick a few favorites, plan the week’s menu and take a list when it’s time to go shopping. Kitchen Shortcuts #4: Buy quality meats when they’re on sale. Divide them into the size you typically use for cooking, wrap and freeze. Not only will you be saving money, you won’t need to butcher or thaw excess meat because your portions are already set up for you. This works for cooking large volumes of rice, quinoa and legumes, too. Kitchen Shortcuts #5: The ultimate weeknight time saver is to do all of your cooking on one day each week. By preparing freezable meals in advance, getting dinner on the table takes little more than opening the freezer and turning on a burner. Another bonus to having ready-to-go meals? Fewer dishes to wash each evening! Use these Kitchen Shortcuts to make your weeknight dinners a breeze while avoiding fast food and sodium heavy boxed frozen dinners. Have questions about your meal plan? Ask us! Email Info@FitNicePT.com or fill out the form below. This entry was posted in Nutrition, Recipes, Wellness and tagged cooking, healthy eating, meal prep, nutrition on June 23, 2014 by meredith@fitnicept.com. Seafood is a great source of protein, Omeag-3 fatty acids and lots of other good for you nutrients. One of Team FitNice‘s favorite ways to dress it up, and add a bit spice, is to top salmon, halibut or fish tacos with this Mango Lime Salsa. You can also try this tasty topping on chicken or a plate of oven baked nachos. Add all ingredients to large mixing bowl and stir. Mix a batch of this Mango Lime Salsa up today, top your seafood or chicken dinner, and start having a meal plan that bursts with flavor. Want help with your meal plan? Ask us! Email Info@FitNicePT or fill out the form below. This entry was posted in Recipes and tagged recipes, salsa on April 17, 2014 by meredith@fitnicept.com. These Easy Breezy Tuna Patties are a simple, heart healthy weeknight meal rich in protein and flavor. This recipe comes to us from Team FitNice member John, who loves the simple, low fat dish any day of the week. 1. In large mixing bowl, combine tuna, eggs, breadcrumbs, salt, pepper and seasoning. 2. Add olive oil to large skillet and warm over medium heat. 3. Pour tuna mixture onto skillet to form two (2), or four (4), patties. 4. Cook 3-4 minutes on each side, until egg is no longer runny and the patties are lightly browned and firm. Give these delicious Easy Breezy Tuna Patties a try for your lunch or dinner table today, and be sure to mix it up by varying seasoning and making them your own! Enjoy. This entry was posted in Recipes and tagged dinner recipes, quick and easy recipes, recipes, seafood recipes on April 10, 2014 by meredith@fitnicept.com. Scallops are a good for you, slightly sweet fruit of the sea dish that boasts many of the same health benefits salmon does. A protein rich, low fat, lean meat, scallops are rich in Omega-3 fatty acids, zinc and Vitamin B12. Team FitNice likes these quick and simple pan seared scallops with jasmine rice any night of the week. 1. Rinse jasmine rice until water runs clean and drain. 2. Add rice to pot and cover with water. Bring to a boil then simmer, covered, for 20 minutes, or until rice is cooked to taste. 4. Season scallops with salt, pepper and Old Bay on both sides. 5. Heat large skillet to medium high heat, add oil and butter. 6. Remove rice from heat and let stand for 10 minutes, fluff with fork before serving. 7. Add scallops to skillet, uncrowded, and cook until the bottom is golden brown, 2-4 minutes. 8. Using tongs, flip scallops and cook other side for 2-4 minutes until golden brown. 9. Line plate with jasmine rice and vegetable of choice. Serve scallops warm. A wonderful addition to any meal or weight management plan, give these delicious, heart healthy Pan Seared Scallops with Jasmine Rice a try the next time your family’s in the mood for seafood fare, or even for dinner tonight. Enjoy! This entry was posted in Recipes and tagged dinner recipes, recipes, scallops on April 3, 2014 by meredith@fitnicept.com.